In a recent lecture sponsored by Emory's QuanTM, learning analytics expert Chuck Dziuban explained trends about the new learning environment that blends face-to-face and virtual instruction. Photo by Timothy Harfield. The Research Initiative for Teaching Effectiveness at the University of Central Florida, directed by Chuck Dziuban, conducted a study for the Sloan Foundation on what factors lead students to be satisfied with a course. • have reduced ambivalence about the value of a course. • see an enriched learning environment. • know the rules of engagement for this course: "What do I have to do to persist in this course?" • see that you are somehow committed to your learning. If you're not, fake it. • see you show respect and concern for them. • see that you are engaged. • have some learning latitude. Students want multiple paths to solutions. Want to be rated an excellent instructor by your students? Facilitate learning, show respect for students and communicate well and you are virtually guaranteed to get an overall rating of excellent, irrespective of anything else. The University of Central Florida's Chuck Dziuban said this unbreakable rule is based on data mined from 1.2 million end-of-course student evaluations of their professors and instructors. If the students rate them excellent in all three of those categories, they will inevitably be rated as excellent overall. Dziuban explained this and more about today's blended learning environment in a recent speech entitled "Teaching and Learning in an Evolving Educational Environment." His public talk was sponsored by Emory's Institute for Quantitative Theory and Methods (QuanTM). "Whether you call it online learning, distributed learning, hybrid learning, blended learning, lecture capture, learning in a cloud, virtual learning, MOOCs, adaptive learning — buzz words enough for you? — I've been evaluating it for the last 20 years," said Dziuban, who serves as director of the Research Initiative for Teaching Effectiveness at the University of Central Florida (UCF), where he teaches research design and statistics. "It changes; it morphs. What it was 20 years is nothing like it is today. What it is today is nothing like it will be two years from now," he said. At UCF, "we have 60,000 students and growing. There's no way we can accommodate our student base in a physical space," he said. "All of our growth comes from the distributed learning environment. We're having a decline in face-to-face enrollment and rising online enrollment. That's a scary curve. We've already done the position paper on what this is going to look like five years from now and we need to make some strategic decisions about it." Dziuban showed data on the three modes of teaching at UCF: online, face-to-face and blended. "What [the outcomes] tell you is there is a slight advantage to a blended course over the other two," he explained. Dziuban described the trend as creating the unbundled classroom, whose walls have been taken down by technology with students demanding instructors be accessible all the time as they constantly "ping each other like whales" with their technology. "Anybody who believes that [teaching] is bounded by the walls of the room — this is no longer true. There's no place to hide," he warned. "So think about what is your persona in a classroom, then think about how would you do this? How would you take that persona and try to move it online?" The new teaching and learning environment has created a subculture of the scholarship of teaching and learning going on within the disciplines driven by the faculty, he said, ticking off "rhetoric, physics, mathematics, education, chemistry, every discipline." Scholarly research projects include work on civility in the online environment and research on whether essay comments make any difference at all in the online environment. The elephant in the room is quality: Are these courses as good as face to face? "I'm astounded by the fact that face-to-face courses became the gold standard for excellence," Dziuban said. "It's like there were no acoustic guitars until there were electric guitars. "I have pushed continually for a definition of quality," he continued. "Here it is: Your course has quality if it demonstrates clarity, authenticity, unity, suspense, economy, depth, proportion, vividness, brilliance, sensitivity, emphasis, authority, flow and precision. "That's the definition of quality. How you measure it I have no idea. The issue is our measurement protocols don't work any more." A class in which constructive engagement is used: "From the day they enter the class, they're evaluating their work and their peers' work. They hate it. By the end, they love it. And when they get on the job, it serves them in good stead." A blended learning course in psychology: "The professor tells the students about their phones, 'Don't turn it off. Let the damn phone ring.' When it rings in class, he answers it, and whatever is on that phone call, he weaves into class. It extinguishes more cell phone conversation than anything else, but he understands this. This is their technology." He relates his syllabus to that generation. A public relations course: "It's a Facebook format. Students put up text, public relations, evaluate it in groups and individually. Public relations firms evaluate their materials. The students never take a test. And they leave with an e-portfolio ready to apply for a job." A digital theater production of "Macbeth": Half the cast and audience were at one university and the other half at another institution, then a third was added. Dziuban also showed examples of how he taught his classes in Second Life. 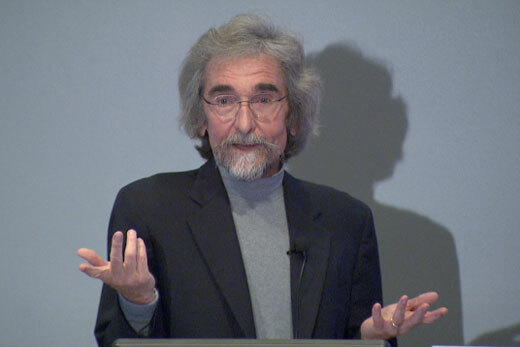 A recording of his Oct. 15 speech, along with a link to his presentation slides, is available on Emory's scholarblogs.